University of Oregon musicians will enjoy a rare opportunity this month to learn from and interact with one of the world’s leading early music chamber ensembles, and the larger Eugene community is invited to participate. The London Haydn Quartet will kick off a weeklong residency with a concert on Sunday, Jan. 12, as part of the 2013-14 ChamberMusic@Beall season, with works by Haydn, Beethoven and Mozart. The featured guest musician for the concert is Eric Hoeprich, who will perform on basset clarinet. The UO has secured the quartet and Hoeprich for a week of programming following the concert, with workshops that will be free and open to the public. 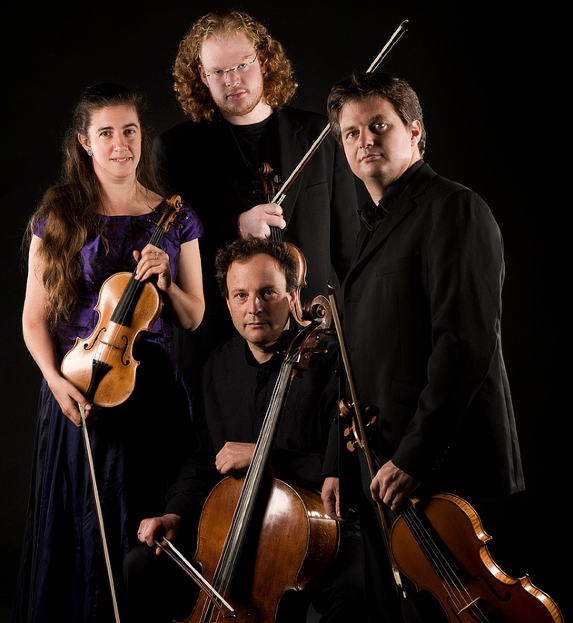 Since the birth of the London Haydn Quartet in 2000, the ensemble has become one of the most respected ensembles specializing in historically informed performances of the classical repertoire. Playing with gut strings and classical bows, their passion for Haydn has led them to present many all-Haydn programs at venues around the world. Period clarinetist Eric Hoeprich is one of many artists with whom the quartet has collaborated. Hoeprich , who is on the faculty at Indiana University at Bloomington’s Jacobs School of Music, has performed frequently as a soloist with many of the major early music ensembles. The musicians' visit to the UO campus is supported by the Robert M. Trotter Visiting Professorship, a mark of distinction reserved for honored guest artists and scholars. Audience members are invited to a free pre-concert "Musical Insights" talk at 2:10 p.m. delivered by UO musicologist Eliot Grasso. Repertoire will include Haydn: String Quartet in B flat Major Op. 50, No. 1; Beethoven: String Quartet in D Major Op. 18, No. 3; and Mozart: Quintet in A Major for Clarinet and Strings K. 581. Tickets are available in advance from the Hult Center (541-682-5000) or the UO Ticket Office (541-346-4363). The renowned London Haydn Quartet and special guest Eric Hoeprich will work with the University Symphony Orchestra during the preparation of Beethoven's Fifth Symphony in a public workshop. Eric Hoeprich, one of the world’s finest period-music clarinetists, will work with a student wind octet on the Mozart Serenade in c minor in a public workshop. Eric Hoeprich, one of the world’s finest period-music clarinetists, will discuss performance practice in the Classical period and coach student clarinetists in a public workshop. The renowned London Haydn Quartet will coach two string quartets and discuss performance practice during the Student Forum of the UO School of Music and Dance. Open to the public.